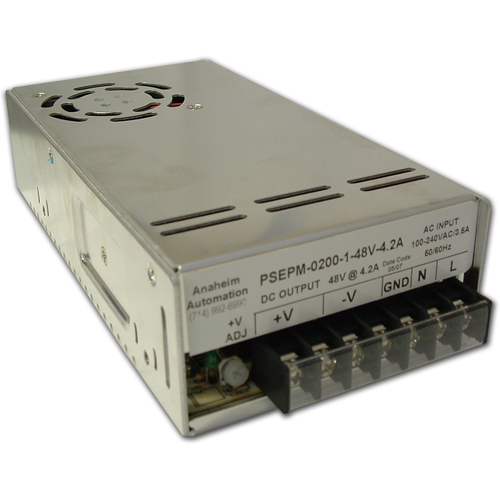 Anaheim Automation's PSEPM and PSESM series power supplies are equipped with several built-in features that allow for a versatile, easy-to-use product at an affordable price. Each series has a built-in cooling fan, a constant current limiting circuit, and an active PFC function. The units also offer short circuit, overload, over voltage, and over temperature protection. The PSEPM and PSESM series comes complete with the option for remote ON-OFF control and an LED indicator for power on. Anaheim Automation's PSEPM series offers versatility and functionality. These power supplies provide up to 320 Watts of power at voltages of 24, 36 and 48VDC with a universal input range of 88-264VAC. Integrated into the power supply is a PFC function, PF>0.93 as well as a built-in constant current limiting circuit, so the unit draws less current and provides up to 89% efficiency. Each power supply is equipped with an LED indicator for power on in addition to short-circuit, overload, over voltage, and over temperature protection features; the option of remote ON-OFF control is also available. In addition to flexibility and cost-efficiency, the PSEPM series offers high reliability and a long lifetime. Anaheim Automation's PSESM series is a cost-effective choice for your power supply requirements. These power supplies provide up to 350Watts of power at voltages of 24, 36 and 48VDC with a switch selectable input range of 90-132VAC and 180-264VAC. Each power supply is equipped with an LED indicator for power on in addition to short-circuit, overload, and over voltage protection features. Compact in size and affordably priced, they provide up to 87.5% efficiency, high reliability, and a long lifetime.